1. Add all ingredients except the lettuce to a large bowl and toss to coat. If you don’t want to mix your mozzarella in, sprinkle it on top once everything else is mixed together. 2. 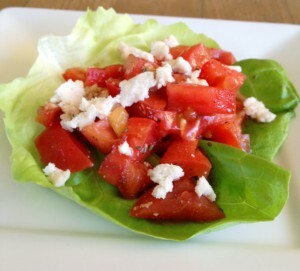 Serve the salad in the lettuce leaves (as pictured above). This entry was posted in Greenhouse Grown, Health, Recipe, Tomatoes, Your Signature Recipes and tagged Fresh, Greenhouse, Growing, Lycopene, Recipes, Seed to Plate, Sustainable, Tomatoes, Vine-ripe. Bookmark the permalink. Comments are closed, but you can leave a trackback: Trackback URL.